Can U.S. ballistic missile defense efforts outpace North Korea’s progress toward an ICBM? Syring’s testimony, which came shortly after South Korea’s presidential office announced that it would suspend the deployment of additional Terminal High Altitude Area Defense (THAAD) launchers, explored the state of the North Korean threat and of U.S. missile defense efforts to protect the United States. His testimony also comes a week after the first-ever successful test of the U.S. Ground-Based Midcourse Defense (GMD) system against an intercontinental-range ballistic missile-class (ICBM) target. North Korea is expected to flight test its first ICBM in the coming years and eventually threaten the U.S. homeland with the capability. In May 2017, it successfully flight tested the Hwasong-12 (KN-17) intermediate-range ballistic missile — the longest-range ground-to-ground system it has successfully flight tested to date. The Hwasong-12 is thought to have a maximum flight range of 4,500 kilometers, which would allow it to comfortably deliver a nuclear payload to the U.S. Pacific territory of Guam. “I would not say we are comfortably ahead of the threat; I would say we are addressing the threat that we know today,” Syring said. “The advancements in the last six months have caused great concern to me and others, in the advancement of and demonstration of technology of ballistic missiles from North Korea,” he added. Syring’s testimony, which is available in full here (PDF), additionally addresses a range of new advances in the United States’ ballistic missile defense capabilities. Also on Wednesday, the U.S. Department of Defense announced that it had upgraded its assessment of the United States’ ability to defend against ICBM-class projectiles, Reuters reports. “GMD has demonstrated capability to defend the U.S. homeland from a small number of intermediate-range or intercontinental missile threats with simple countermeasures,” an unreleased memo memo said, Reuters notes. 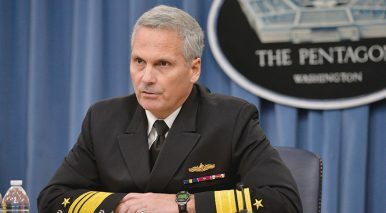 The new assessment represents an improvement over the previously “limited capability” the U.S. Department of Defense had assessed for defense against ICBM-class targets. That said, May’s test of the GMD system against an ICBM-class target took place under favorable conditions and did not simulate a range of factors that would affect the system’s performance in wartime against a real adversary that would presumably use a longer-range ICBM and deploy countermeasures. The United States Missile Defense Agency considers any missile with a range in excess of 5,500 kilometers to be an ICBM. What an unusual statement out of North Korea tells us about its future missile testing plans.